Success Is Great. But Significance Is Lasting. You ve achieved a measure of success in the first half of life, and it s been a thrill. But deep in your heart, you want your second half to count for something far more. Something bigger than you. Significance. You re not alone; you re in Halftime. You want to discover where your deepest passions intersect with your greatest abilities and harness them to help change the world. 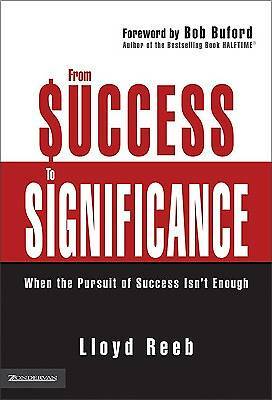 But what does significance look like? How do you attain it? What will it cost you? What if you are not yet financially independent? Who can help you make sense out of this stage of life? Lloyd Reeb knows how it is. He s wrestled with the same questions---and found answers. In From Success to Significance, he unfolds a blueprint that has helped thousands of men and women redefine success and infuse their lives with eternal significance. Adapt Reeb s approach to your circumstances and, with God s help, put it in motion. It works, and it will work for you. Discover God s unique purpose for your life. Your talents, your drives, and everything you are will make sense in a new way and have an impact you ve never dreamed of. Go ahead, start dreaming. Because significance is within your reach, and it starts by finding the freedom to dream. Many people measure their success by wealth, recognition, power, and status. There's nothing wrong with those, but if that s all you re focused on, you re missing the boat. Lloyd Reeb shows that if you focus on significance---using your time and talent to serve others---that s when truly meaningful success can come your way. "